CEO Lawrie Gloster with the Vice Lord LieutenantOnly a handful of companies are selected each year to receive the award, which celebrates achievements in Innovation, International Trade and Sustainable Development. Following the announcement the directors of the company were invited to an award winners' gala in London before receiving the trophy on October 11th. 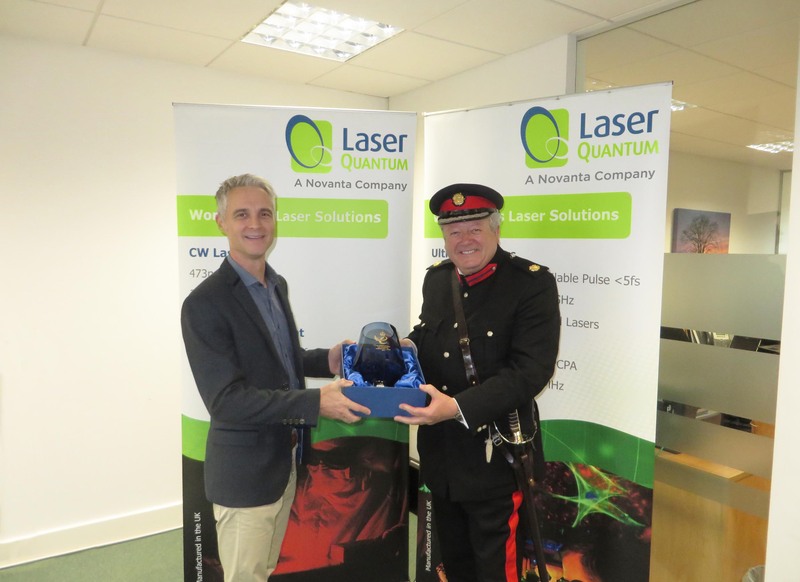 In order to present this prestigious award, laser Quantum was visited by the Vice Lord-Lieutenant of Greater Manchester, Paul Griffiths DL. When presenting the award, the Vice Lord-Lieutenant also quoted a speech verbatim from the Queen; in addition to the trophy a certificate signed by both the Queen and Prime Minister Theresa May was also presented. The Vice Lord Lieutenant then took a tour of the company to understand the processes involved in the production of Laser Quantum's continuous wave lasers, renowned for their robustness and reliability to survive a range of environmental conditions. Laser Quantum is only 1 of 7 companies to be awarded the prestigious Queen's Award in the constituency of Greater Manchester for its outstanding achievement, demonstrating an export growth of over 57% in the past 3 years. This marks the second time that the company has won the award, receiving it previously in 2012, each award stands for 5 years. Lawrie Gloster, CEO of Laser Quantum, said "Being presented with the Trophy for the Queen's Award is an incredible achievement for all of our staff. It is a physical reminder of the hard work and effort of our employees and of our impressive growth over the past 5 years. It is a very prestigious award and receiving it is a great honour."